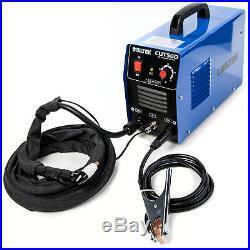 Plasma Cutter 50AMP CUT50D DC Inverter Dual Voltage 110V/220V Portable - US Plug. 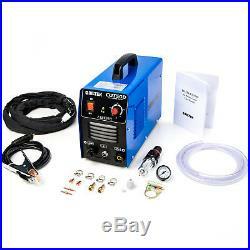 NEW Plasma Cutter 50AMP CUT50D DC Inverter Dual Voltage 110V/220V. This plasma cutter is perfectly designed for cutting stainless steel, alloy steel, mild steel, sheet metal, copper aluminum, and other metal materials. 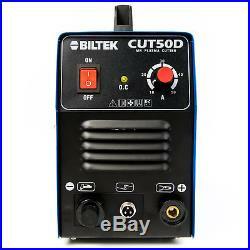 Plasma Cutter 50AMP CUT50D DC Inverter Dual Voltage 110V/220V. Cut Up to 1/2 Thick Steel with the High Performance Cutting Torch. 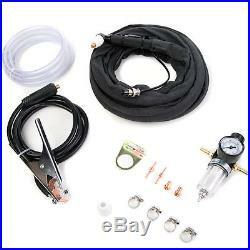 Non-Pilot Arc Torch Provides a Longer Life for Consumables. Advanced Inverter Technology Means High Cutting Performance. 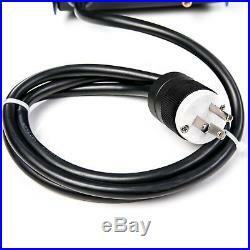 Input Voltage: 110-220V, 1-PH, 50/60Hz Dual Voltage. 10mm Thick Steel (Maximum Cut). 8mm Thick Steel (Optimal Cut). Air Supply: Clean, Dry, Oil-Free Air. Material: Stainless Steel, Mild Steel, Aluminum, etc. 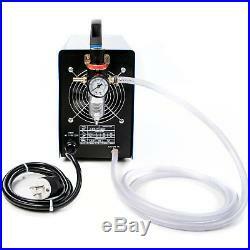 Important Please Read: You will need to have your own air supply from an air compressor. 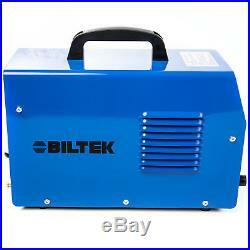 Plasma cutter includes a standard US. Plug, you will have to connect a 220V plug to reach the 50A cut specs. 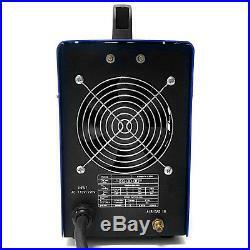 1x Plasma Cutter CUT50D Power Supply. California Customers: WARNING: This product may contain chemicals known to the State of California to cause cancer, birth defects or other reproductive harm. They do not sponsor or endorse our materials. This Product is intended for off-road use only. We cannot be held liable if the product is used in conjunction with any vehicle on U. Or Canadian roads or highways or in any other jurisdiction where the Product would not meet safety or emission standards, as specified by that jurisdiction. 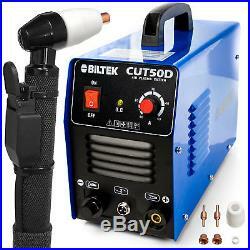 The item "Plasma Cutter 50AMP CUT50D DC Inverter Dual Voltage 110V/220V Portable US Plug" is in sale since Monday, October 22, 2018. This item is in the category "Business & Industrial\CNC, Metalworking & Manufacturing\Welding & Soldering Equipment\Welding\Welders, Cutters & Torches\Plasma Cutters". The seller is "2wheelproject" and is located in Buffalo, NY. This item can be shipped to United States, Canada, United Kingdom, Denmark, Romania, Slovakia, Bulgaria, Czech republic, Finland, Hungary, Latvia, Lithuania, Malta, Estonia, Australia, Greece, Portugal, Cyprus, Slovenia, Japan, China, Sweden, South Korea, Indonesia, Taiwan, South africa, Thailand, Belgium, France, Hong Kong, Ireland, Netherlands, Poland, Spain, Italy, Germany, Austria, Bahamas, Israel, Mexico, New Zealand, Philippines, Singapore, Switzerland, Norway, Saudi arabia, Ukraine, United arab emirates, Qatar, Kuwait, Bahrain, Croatia, Malaysia, Chile, Colombia, Costa rica, Dominican republic, Panama, Trinidad and tobago, Guatemala, El salvador, Honduras, Jamaica, Viet nam.